Like a big wingshot bird, the proposal by the Tennessee Wildlife Resources Commission to open season on sandhill cranes keeps flopping around in my head. People who object to hunting sandhill cranes do so for a number of reasons. However, we are generally characterized by advocates of hunting as being uninformed, leading with our hearts rather than our heads. Perhaps they’re right. I will confess to having trouble getting my head around the reasoning behind the Tennessee crane hunting proposal. Plant 750 acres of feed crops for waterfowl. Watch sandhill cranes join the ducks and geese in exploiting the superabundant food. Start a festival for people who enjoy observing the stately birds. Celebrate a festival for 17 years as the wintering crane population swells to 48,000, and watch as a portion of the flock ceases to migrate, sticking around to feed on early spring plantings of winter wheat. Cancel the festival, then shuffle its dates around, back off the food crops to 450 acres, and propose a hunting season on cranes. All the while, grant crop depredation permits, giving farmers permission to shoot cranes that stay around late enough to eat their germinating winter wheat. I confess I’m left scratching my head. I have an incomplete understanding of the wildlife management principles illustrated here. From my uninformed perspective, it seems ill-advised to offer a migratory bird population so much artificial food that it ceases to migrate as it’s been doing since the Pleistocene. Is shooting about 2% of the population really the best answer? What is needed here, it seems, is not more crowding but a natural dispersal of the population, encouraging them to move on south. Now, being a birdwatcher, I admit to being ignorant of the fine points of wildlife management, but what if Tennessee were to taper off the feeding program? Maybe the cranes would keep heading south when the food ran out. Silly, I know, but it’s just crazy enough–it might work. The converse certainly worked. Tennessee is the first state in the Eastern Flyway to propose a hunting season on sandhill cranes. Kentucky announced its crane hunting season on December 6, 2010. I heard it on the radio as I was writing this post, stopping in mid-tap to stare at the speakers. And oddly, Kentucky isn’t accepting public comment. Have they observed the outcry over Tennessee’s proposal? Memo to Kentucky: Announcing that you’re not accepting public comment doesn’t stop people from calling and writing their legislators. Oh, and birdwatchers might like to know that Wisconsin’s planning a sandhill crane hunting season, too. Wisconsin: home of the privately funded International Crane Foundation in Baraboo, where the big white whooping crane was snatched back from extinction. Imagine how Wisconsin’s thousands of self-described “craniacs” are going to feel about that. But we mustn’t lead with our hearts. We must accept the wisdom, the necessity of shooting sandhill cranes. 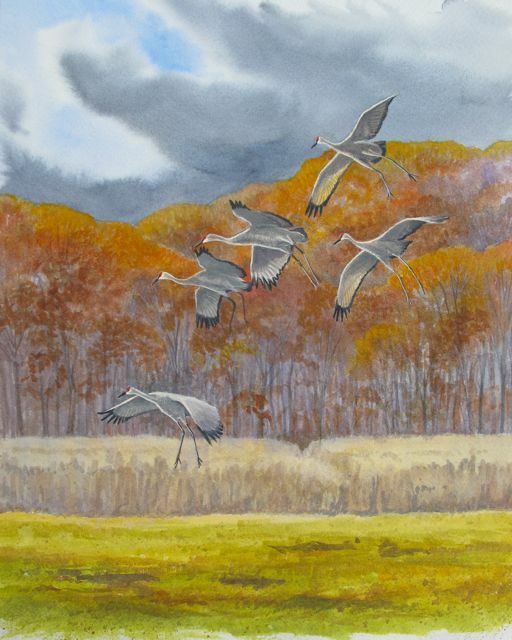 Ultimately, the proposal to hunt Tennessee’s sandhill cranes is about hubris. It’s about manipulating wild populations as we see fit, about tilting the balance of nature toward huntable species by feeding them artificial foods and encouraging them to hang around to provide us a little sport. Try as I might, I cannot cram the lanky four-foot length of a sandhill crane into the slot in my brain marked “Game Species.” They’re too tall, too graceful, too ancient and yes, much too magical. There goes my heart again. Head says: They reproduce too slowly, producing one colt per year if they’re lucky. Ducks and geese can lay a dozen eggs; a crane lays two, and only one colt usually survives. That youngster is still heavily dependent on its parents for guidance in its first winter of life, and yet we’re proposing to let hunters shoot right into those family units. For sport. For fun. For food, maybe, if they have enough strong marinade. Pretty gamey, I’m told. I intend never to find out for myself. We should not be marinating the meat of sandhill cranes. We should be looking up at them alive and flying, our heads thrown back in wonder, gratitude and awe. 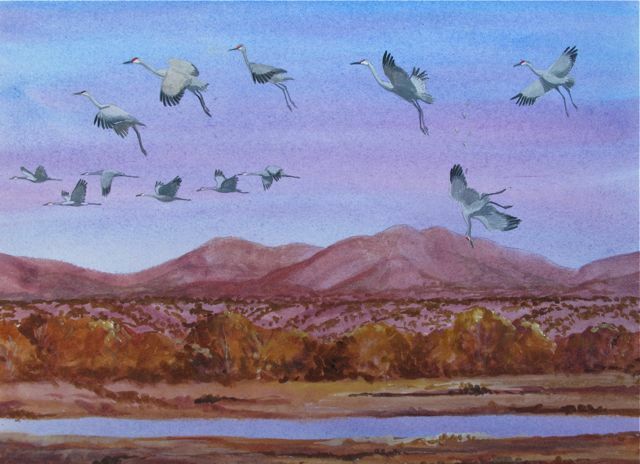 We should be searching their cloud-gray numbers for the big white cranes who travel with them, and are at risk of being shot, their precious genes squandered in the mud of a cornfield. In my view, the great irony in this whole proposal to hunt cranes is that the majority of people who are aware cranes exist feel exactly as I do, vastly outnumbering those who would like to take a shot at one. Note to Tennessee, Kentucky and Wisconsin: Those cranes you’re proposing to shoot are everyone’s cranes, not just yours. They may breed in Wisconsin and pass through the southern states, but they belong to everyone, and your proposal to let a small subset of hunters fire on them is not popular with the majority who want them left alone. You are shooting yourself in the foot. People who believe strongly in their perceived right to hunt whatever they wish can be persuasive in characterizing birders and wildlife watchers as soft-headed and silly for having an emotional connection to birds and animals, for being guided by heart and not head. I believe to my core that it is desirable to hold some species sacred. I feel that way about sandhill cranes because I have observed, from Nebraska to New Mexico, from Michigan to Ohio, that they are potent ambassadors for wild things and wild places to the many thousands of people who are moved by them. These are not necessarily birders, just ordinary people who are stirred by the sight and sound of cranes. Cranes, I submit, are worth infinitely more alive than dead. Just ask the director of the Lillian Annette Rowe Sanctuary on Nebraska’s Platte River, where sandhill crane tourism brings 15,000 visitors from all 50 states and 46 foreign countries; brings more than $10 million into the local economy every year. All without firing a single shot. Wildlife watching is the fastest growing sector in tourism. I’d love to do this experiment. Take 1,000 people who know what a sandhill crane is. What percentage of them do you think would want to bring one down with a gun? What percentage would simply want to watch one fly overhead? We haven’t even begun to tap the tourism potential of live Eastern Flyway cranes, and states are already proposing to shoot them? Your best bet to have an impact on the TWRA decision is to contact the TWRA commissioners with letters, phone calls, etc. At some point we’ll provide the results of the survey, but keep in mind that it was not a well designed, scientific survey, it was biased in many ways and is not likely a very reliable source of information. Birders, photographers, wildlife watchers: we don’t need SurveyMonkey to tell Tennessee what we think about opening a season on sandhill cranes. Comments period ends mid-January. A public meeting will be held Jan. 20 and 21 in Nashville, with an opportunity for public comments. Information: Ask.TWRA@tn.gov or 1-800-624-7406. If you can’t attend, please…Write them NOW. Hey, Julie, this is a magnificent rant. I love it when you lead with your heart and follow up with logic and statistics for the sake of the heart challenged. Defenders of the wild have got to stop being timid and defensive. Bless you Julie. Go Julie! A post full of heart and thought-provoking grit. Sandhill cranes are infinitely more valuable to all of us as ambassadors of hope, peace and grace. They are free-flying symbols of nature’s ability to recover when humans conserve habitat. Even without their historical come-back story, the awe and wonder a sandhill crane inspires in the heart of those lucky enough to witness their flight and melodious call, makes every crane in the eastern population valuable beyond words. That anyone would shoot a crane is just mind-blowing to me and that Tennessee would want to start a hunting season on them just because they can is just insane. Here’s hoping that the right thing gets done in Tennessee. @Corey: no hoping allowed. Julie has ably provided addresses to which we can write letters and emails expressing our thoughts/outrage. Wonderful post. However, as a birder who regularly deals with management and hunting decisions, I urge everyone who takes up this cause to tread with caution and understanding. For decades hunting has funded a large part of the wildlife conservation in the U.S. This is certainly changing now and I have seen too many instances where hunters have felt persecuted by birders. This can lead to harsh and needlessly antagonistic fighting over who has domain over the wildlife population. All of us, hunters and birders, have vested interest in keeping wildlife populations healthy and wild. Please birders, be respectful of your hunting brethren, realizing that we all enjoy wild birds. Also, keep in mind before you wade into this fight, that cranes are hunted in many other states. As are woodcock, most ducks, swans, geese, and grouse to name just a few birds. The management decisions for hunting these birds are sometimes sound, sometimes not. Ultimately each state owns its wildlife and it is up to them how to manageme the populations within their borders. Even though it is tempting to think with the heart, keep in mind that wildlife regulators can rarely afford to do so. In Tennessee, both the farm lobby and the hunter lobby have significant clout. The economics of the situation is such that birders, though they have numbers, will have a hard time being heard at the table. Reactions from the heart that have a tendency to paint managers and hunters in a bad light will only serve to alienate us from the decision making process. So again, I urge birders to participate in the discussion. But be respectful and thoughtful as you do so. Tim makes a great point. It’s good that birders are getting organized so their voice has at least as much clout as hunters, whose numbers are shrinking every year. More birders are becoming aware of the fact that hunters pay a good portion of the cost of habitat restoration and management of non-game species. If nothing else, we need to remember the people sitting across the table from us in these discussions may not call themselves “birders,” but they are those most likely to share our appreciation for open space and genuine interest in seeing bird species thrive. (Who else besides birders and hunters these days even notices ducks or cranes flying overhead, let alone knows what species they are?) We’ll all do better to find common ground where we can. Julie, your post and paintings were beautiful. Thank you, Tim. Having deleted some comments here and there that use words like “yahoo” and “redneck,” I share your desire to stay on high ground in presenting the wildlife watcher’s case, however angry or outraged we may feel. The economic argument that hunters pay for most of what wildlife watchers passively enjoy isn’t a really strong one in this case. I understand from inside sources that the Tennessee crane hunt will actually cost the state more than it will bring in. And I’d like to point out, from the USFWS’s own study, “Priority Information Needs for the Sandhill Crane,” that visitors to Nebraska’s Platte River staging area bring in an estimated $30 million to the local economy each year. Hunting of sandhill cranes nationwide brings in around $588/hunter, which works out to $6.5 million in revenue *nationwide. * So ecotourism in *one state* (which is the only one in the Central Flyway which does not allow crane hunting) brings in five times the revenue that hunting does across the entire nation. Money talks. Crane hunters simply can’t claim that revenues from their sport shores up the passive recreation of birdwatchers where sandhill cranes are concerned. If Tennessee were really thinking, they’d exploit the dickens out of that huge gathering of cranes, just the way Nebraska has, and forget shooting 2% of the population, alienating the very people they’ve been cultivating for 17 years, just so they can toss another game species to a small subset of the hunting community. I’ve heard from a number of lifelong hunters who wouldn’t shoot a crane. Not every hunter thinks this is a sound idea. I also respectfully disagree that “every state owns its wildlife.” The State of Tennessee is detaining these cranes, which are on their way to the Gulf States for the winter, by overfeeding. These migratory birds belong to no one state, and everyone. This is the very reason that the U.S. Fish and Wildlife Service has ultimate jurisdiction over whether any one state may allow shooting them. If Tennessee decides to hold a hunt over the protests of the majority, USFWS should be prepared to hear from us. I join you in urging all respondents to use facts, not emotion, to further their case, and by all means, to write. Thank you for your input. Julie, again, thankyou for allowing this important debate to take place on 10,000 Birds – I for one am proud that you consider the blog a valid platform for such an important issue. Whilst I feel that – living in the UK – I’m not necessarily in a position to contribute much to the debate, I can not allow one of Mr Strudwick’s comments to pass without a response. He quite rightly asks that the whole debate take place in a calm and polite atmosphere, but to someone like me who has never and will never hunt to say that “Please birders, be respectful of your hunting brethren, realizing that we all enjoy wild birds” is inflammatory and patronising. I won’t speak for all birders (just as I assume Mr Strudwick wouldn’t presume to speak for all hunters) but I’m not remotely happy with my enjoyment of wild birds being compared with how a hunter ‘enjoys’ wild birds. I enjoy birds for the life and energy they have and all that brings, a hunter – apparently – enjoys killing them and taking that life and energy away (and if they don’t enjoy it, why do it?). I have said many times on 10,000 Birds that I am very tired of hunters and birders being lumped together as if we have a raft of common interests, and of being told therefore that birders should respect and yield (and it’s always birders expected to give, not the other way around). I realise that hunting is ingrained in the American psyche, but Mr Strudwick and others who urge birders to be respectful of hunters should be aware that outside the US there are a huge number of people who do not and will not respect anyone wanting to shoot a Sandhill Crane, and that from this side of the Atlantic allowing a dwindling group of people to kill them appears anachronistic and uncivilised. Whilst I feel that – living in the UK – I’m not necessarily in a position to contribute much to the debate, I can not allow one of Mr Ludwick’s comments to pass without a response. He quite rightly asks that the whole debate take place in a calm and polite atmosphere, but to someone like me who has never and will never hunt to say that “Please birders, be respectful of your hunting brethren, realizing that we all enjoy wild birds” is inflammatory and patronising. I won’t speak for all birders (just as I assume Mr Ludwick wouldn’t presume to speak for all hunters) but I’m not remotely happy with my enjoyment of wild birds being compared with how a hunter ‘enjoys’ wild birds. I enjoy birds for the life and energy they have and all that brings, a hunter – apparently – enjoys killing them and taking that life and energy away (and if they don’t enjoy it, why do it?). I have said many times on 10,000 Birds that I am very tired of hunters and birders being lumped together as if we have a raft of common interests, and of being told therefore that birders should respect and yield (and it’s always birders expected to give, not the other way around). I realise that hunting is ingrained in the American psyche, but Mr Ludwick and others who urge birders to be respectful of hunters should be aware that outside the US there are a huge number of people who do not and will not respect anyone wanting to shoot a Sandhill Crane, and that from this side of the Atlantic allowing a dwindling group of people to kill them appears anachronistic and uncivilised. Julie….like the Lorax who speaks for the trees, you speak for the cranes. And you keep speaking, strong and eloquent, until the final hour. I think one of the best things I have ever done in life was send you the letter that flagged you about this issue; you have taken the proverbial ball and have run with it like no one else can. Thank you, thank you, thank you. 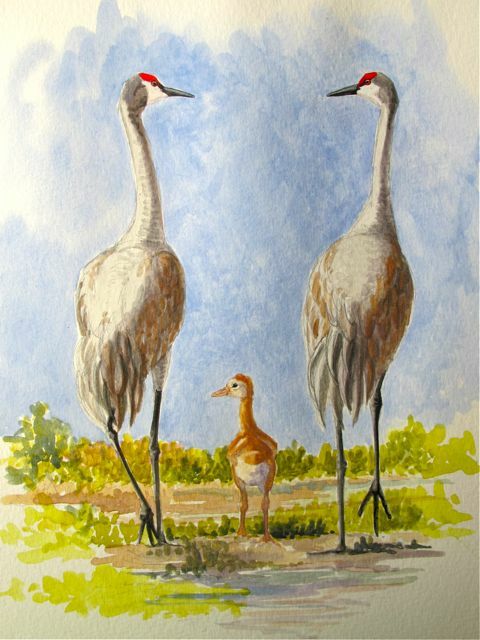 PS….If I ever have the $$$ I used to, I want an original sandhill crane painting by you. Thank you, Janet. When you say jump I usually ask how high. But you’re wrong about one thing. Vickie Henderson is the linebacker on this cause. She’s put up a series of posts at http://vickiehenderson.blogspot.com that are rife with great information and well-directed calls to action. As a Tennessee resident and Operation Migration insider, she has the inside knowledge, fiery passion, strategy, connections and clout to be truly effective. She’ll be at that January meeting in Nashville, speaking out; I’ll be holding down the fort with the kids in snowy Ohio, all our fingers and toes crossed that TWRC sees the light from the bonfire we’ve lit for the cranes we love. As someone who grew up in a community where hunting is still fairly popular, and now lives in a state where hunting is even more popular, I assure you that hunters have no right to claim that they are speaking with the head and leave us with the squishy heart. As commenters remark above, hunters are equally emotionally driven, it’s just that the emotions that they are tapping into are slightly different. Much of hunter input into hunting policy is driven by sociological issues that can be boiled down to the phrase “culture war”, whether it’s about ‘preserving’ a romanticized tradition (which I can sympathize with, although I feel in many cases it’s misguided) or sticking it to elitest city folk (which I can’t). It’s all well and good to say that the management decisions are made scientifically (and, as you correctly point out, they often aren’t even that) but the initial impetus for any given decision is still a value judgement. It’s just as much of a mistake to overestimate the values that hunters share with wildlife watchers as to underestimate them; lean too far to either side, and we won’t understand what’s going on. The value judgement in play here, apparently, is that the purpose of wildlife management in the U.S. is first and foremost to increase the total number of shootable animals, not the health or sustainability of ecosystems. There are still lots of people who hold that view, but it’s no more rational on first principles than the non-hunters’ view. Unfortunately, the population that holds that view maps strongly (not perfectly, but strongly) to a group that, for reasons too long to get into here, have been stoked to consider any contradiction from anyone else to be imposition, or even persecution, by clueless outsiders. Definitely it’s something to be aware of. It will influence the debate, for sure. But don’t ever let them tell you that they are the practical ones with the rational high ground. @Charlie – I understand the reluctance to identify with hunters. I was once the same. However, I have since met some very passionate, concerned conservationists who also happen to be avid hunters. Painting hunting as uncivilized creates a needless rift and puts aside the debt that modern conservation owes the hunting movement (Theodore Roosevelt was an avid hunter and he helped found the USFWS) That is not to say that birders should give way to hunters. Conservation of wildlife is not a zero sum equation where hunter win and birders lose. In the case of the Tennessee cranes, birders have some very valid arguments (low population recruitment, artificially enhanced staging areas, and enhanced ecomonic opportunites via tourism) that should be conveyed to managers and politicians. If the birding community involves itself in an intelligent way in this fight it will leave us looking less like “soft-headed” hobbyists and more like serious conservationists. On the other hand, if we approach the situation with acrimony and without respect we will continue to be ignored in these important decisions. @Julie – Legaly speaking each state does own their wildlife. The individual states are responsible for hunting permits, conservation actions, and management decisions affecting all wildlife within their borders. In the case of cranes and other birds covered under the Migratory Bird Treaty Act the U.S. Fish and Wildlife Service excercises oversight over these decisions to ensure the stability of migratory populations. Also, any bird listed or petitioned for listing is subject to management decisions by the USFWS. In most cases, this is done in conjuction with plans developed by the state wildlife agency. Very rarely does the USFWS flat out stop a management action proposed by a state. @T. Ludwick: Theodore Roosevelt supported conservation after hunters nearly wiped out the game species he wanted to hunt. Even though buffalo were clearly on their way out he still went out and shot his own in 1883. Yes, TR’s conservation successes were wonderful and yes hunters can have a conservation ethos but there is room in this type of debate for both those who oppose hunting on moral grounds and those who do so on conservation grounds. Neither is soft-headed. Why is it only when it comes to hunting that those who are opposed for moral reasons are called soft-headed? If anyone opposes anything from the “right” or “conservative” side of an issue for moral reasons it is accepted as a justified and justifiable argument. @Corey – Both you and Carrie bring up an excellent point about the sociology of hunting. Hunting is often seen as the essence of Americana. It is the mythos of the “can-do” pioneer spirit that built the country. In addition most wildlife managers are also hunters and that, as of yet, there are very few ways for state and federal wildlife managers to gain funding for conservation from non-hunters. These three factors make it very hard for anyone who opposes hunting on purely moral grounds to have their voice heard. Is this fair or right? Nope, but it is what it is. I would hope this issue galvanizes birders into taking a broader interest in the management of the species they enjoy. I would encourage birders to do three things: 1) learn what your state and federal wildlife laws involve, 2) consider attending a local Ducks Unlimited or Wild Turkey Federation event, 3) if you know a bird hunter, talk to them and learn a bit about them. If more birders get involved in management, maybe we can help managers realize that there is an entire community that values wildlife for much more than its huntability. Unrelated aside: Since Corey brought up morality I’d like to make a plea to all birders out there. Please think before you jump on a plane to twitch that super-rare bird this year. Flying from New York to San Francisco = nearly 2.5 tons of CO2 emissions. Is this somehow more moral than killing a crane because you didn’t kill the white wagtail? Not advocating the end of all birding travel. Just food for thought when you’re contemplating your next big twitch. Everybody, buy a duck stamp. Buy several. It’ll get you into wildlife refuges for free, and it’s the most direct conversion of dollars into saved habitat going. Stick it on your binoculars and wear it with pride. I personally know nobody who gets on a plane just to “twitch” a bird. I’d like to know more people like that; maybe they’d loan me some money. Suspect that’s a different cohort of people than I hang with, and I know a lot of birders. I know some who’ll drive a few hours to see a rare bird (I won’t) but the rest of us work the life bird acquisition into business and pleasure trips we’d be taking anyway. Let’s try and keep the topic to crane hunting, and what concerned birders can do to make their voices heard in wildlife management decisions. Don’t forget to write. IMO one of the biggest things birders can do is attend scoping meetings. By law every project initiated on federal propery or funded with federal dollars is required to have public input. This includes any hunting measure that affects a species covered under the MBTA of which the sandhill crane is one. Each and every one of these is a chance for local birders to meet and interact with state and federal wildlife officials. Often these meetings are dominated by landowners, sportsmen, and developers. Scoping and public meetings are a great forum for direct conversation with wildlife officials as well as others who have a stake in the decision. T – seriously, in one sentence you praise some hunters – who kill – as avid conservationists, in another patronise some birders – who don’t – by saying that “If the birding community involves itself in an intelligent way in this fight it will leave us looking less like “soft-headed” hobbyists and more like serious conservationists”. So once again the hunters are portrayed as serious, presumably because they go around killing things without emotion, while emotional people who oppose them are ‘soft-headed’. You need to understand, as I said, that there are a large number of people OUTSIDE the US who don’t carry guns as a matter of course and who do think that hunting is uncivilised. You may not talk to them but I do. And surprisingly just because we care about wildlife but don’t kill it doesn’t make us incapable of rational and intelligent debate, or that we cannot be excellent conservationists. No matter how much you attempt to soft-soap me otherwise (I’m not some youth who hasn’t thought very deeply about these issues) allowing people to kill Sandhill Cranes is wrong, and IMHO that should be the starting point for any argument for those of us opposed to hunting them. And, T – we need to help “managers realize that there is an entire community that values wildlife for much more than its huntability”? Don’t they read, have the internet, talk to people? Help me out here, because this is surprising news: what course do you take to be a Wildlife Manager that you can pass without understanding that not everyone hunts? Or are things so very different in America that it’s actually impossible for wildlife managers to envision anyone not wanting to kill the wildlife they ‘enjoy’? Julie et al – apologies for banging the same drum I always do, but I am SOOO sick of being told what (theoretically) enlightened and wonderful people Sandhill Crane hunters are when I passionately believe they are not. End of. It’s high time the system was jiggered so you could register as a non-hunter when buying the things. It’s now impossible to track how many birders are buying them. But it buys wetlands, so I will continue. I would love for the system to be “jiggered” that way. And if the perception of who buys the duck stamps changes I’ll be more than willing to buy one. But I don’t see why I should put my hard-earned money into a program to conserve land that will then be managed to benefit hunters’ interests. But I will continue to put all I can afford into conservation causes. I have to agree with Corey, duck stamps are not the way to go. There is a real fear among the state wildlife communities that the declining numbers of hunters is going to lead to a loss in money for management activities. Birders purchasing duck stamps will only mask the shift from consumptive use of wildlife to recreational use. We desperately need some sort of “Birder Pass” for our state management areas and wildlife refuges that recognizes the increasing use of the areas by non-hunters. Charlie – I hear your concerns. I am not a hunter and couldn’t contemplate killing crane…or even a snipe. However, in America hunting is at times treated as almost a sacred right. Starting any argument on the premise that hunters are morally wrong quickly shuts down any hope of meaningful discourse. Yes, wildlife managers do recognize the birding and nature watching community. Sadly though, we rarely rarely have the clout necessary to be heard. The proposed Tennessee crane hunt is the perfect place to test the growing conservation awareness of the birding community. The crane is a big, charasmatic bird that most people would agree should not be shot. There are many sound ecological and economic arguments against crane hunting in Tennessee. However, I firmly believe that if birders come to the table without respect for the hunting community we will be dismissed. I could go on, but my posts are long-winded enough. As a birder who has long had to straddle the hunter-birder divide in my chosen profession, I can only beg that all who take up this cause be repectful, civil, and open to other views (whether you agree or not). I like this last comment, T. Ludwick. How hard can it be to have a nongame wildlife stamp available for purchase? Ohio just did it. If we did it, any state can. I’ve never thought about birders masking the shift from consumptive to nonconsumptive use of wildlife when they buy duck stamps. Hmmm. The Tennessee hunt proposal is the perfect place to put the birding community to the test, yes. Ours is a group that has long taken its free entertainment for granted, which was a point I made in my original Bird Watcher’s Digest article about crane hunting, “Love and Death Among the Cranes,” a couple of years ago. Can we rise up, not only howling in outrage, but offering real support for nongame wildlife programs in involvement and money? Demanding our own nongame wildlife stamp to show just how much we care? It’s time we drove a stake through the claim that hunters pay for everything and so are entitled to shoot whatever they wish. It’s time to get creative and assertive, and not assume someone else will take care of the wildlife we treasure (because they always have). Tennessee is contemplating letting a small subset of hunters “take care” of cranes in a way that we abhor. What are we going to do about that? What will we do about it in Wisconsin and Kentucky? Just let them bang away? Or finally make ourselves heard and offer our ideas and our financial support for habitat acquisition? Seriously, state governments. How long do we have to ASK you to find a way to let us contribute?? We shouldn’t have to be buying up hunting licenses to support conservation of all the “other” wildlife we care so much about. If ever there were a poster child for charismatic, electrifying nongame species, the sandhill crane should be it. We should be exploiting their beauty and majesty with ecotourism, not blowing them out of the sky. If you want to energize yourself to write in protest, just Google some images of sandhill crane hunting. I don’t even know where to start. Julie, you and Vickie have written eloquent about the Sandhill Crane dilemma and what we can do to help stop this needless proposal of killing what I consider to be other sentient beings. I may be a soft-headed, soft-hearted human being but I don’t believe that humans have ownership of any other animal on this planet, much less, as Mr. Ludwick states, “ultimately each state owns its wildlife and it is up to them how to manage the populations within their borders.” This statement may be true legally but in my opinion, morally it is ridiculous. I don’t have much respect for people who think because we happen to have opposable thumbs, we are superior to all other species and therefore have the right to do with them as we will. Just consider the dolphin. I must agree with Mr. Ludwick when he says “there is a real fear among the state wildlife communities that the declining numbers of hunters is going to lead to a loss in money for management activities.” In a capitalist society like ours, it is all about the money. Wildlife managers are worried about the security of their livelihoods. Until the amount of money created by wildlife conservation exceeds the amount of money coming in from the “taking” of wildlife, managers will be swayed, not by what is best for the wildlife, but what is best for their pocketbooks. When we talk about the fact that wildlife watching now brings in more revenue to local communities than hunting or other “recreational activities” we have to remember that these funds don’t necessarily go to wildlife management. I believe it is time for wildlife conservationists to come up with a nationwide strategy to protect our wildlife by supporting conservation in a way that will benefit wildlife management. Until their jobs are secure, we can’t depend on wildlife management to actually do what is right for the wildlife in America. They will always be swayed by those who keep their coffers full. Call me cynical but this seems to be what we are up against with respect to the Burrowing Owl in California with the California Department of Fish and Game (CDFG). We need to make sure our voices are heard whenever we confront wildlife management decisions that we think are contrary to sound wildlife conservation. @T.Ludwick is simply stating the truth about dealing with our country’s wildlife management programs as they now exist. He doesn’t say it’s right. He doesn’t call those of us who are opposed to this proposed crane hunt “soft-headed.” He warns us, quite correctly, to do our best not to appear that way to our opposition. It’s basic political strategy, and why would those of us in the conservation community want to ignore that? It might be that Tennessee will be a stage for the kind of organized mass that moves political mountains. If so, fantastic! But if not, we gained nothing by forgoing diplomacy and alienating decision-makers. Thanks Amy. I also think this would be a great time for the new ABA leadership to step up. Could you imagine if the ABA were given the same respect in the conservation world as Ducks Unlimited or the National Wild Turkey Federation? If this was something to do with duck hunting, you can bet DU would have representatives talking to managers, canvassing local hunters, and advocating for their policies. As the organization that represents birders, we should expect the ABA to do the same. The proposal of a crane hunt in Tennessee is obviously an issue close to many birders hearts. ABA members, please ask your leadership to join this cause. In Kentucky, out of the $50,000,000 KDFWR budget, only $32,000,000 comes from what us hunters pay in fees and licenses. So, $18,000,000 (36%) comes from non-hunting sources, sources who rightly contend that they should be represented at the table when these decisions are made. Since only 2/3 of the kids in the state’s hunting families are continuing to participate in the sport, that 36% of non-game PUBLIC funding is only going to go up. So to answer your declarative statement that eco-tourist don’t pay the bills for conservation in this state, the facts are that they do pay a sizable chunk, more than a third. And from what I could tell by attending the public meetings, they got zero representation, certainly none of the Commissioners paid any attention to what they had to say, and many gave facts and figures, not just opinions. Also, the agency may have gone so far as to fund, in part at least, its pre-public release smear campaign (claiming that any opposition to THIS hunt was an affront to hunting in general) against perceived opponents (i.e. bird watching, eco-tourist, etc.) with their own money that made up that 36%. As far as I can tell, there is no segregation of the monies coming into the agency based on that percentage, and KDFWR has not responded to inquiries regarding that. That is like someone feeding bacon to their pet pot belly pig (I know someone who did that)…it just ain’t right on several levels.